In this part I will try to explain how to design easily extensible and maintainable game elements that control their own internal state and behaviours. An internal state is best described as being the soul and mind of the entity. In the first part I described why composition is better than inheritance. In a nutshell composition provides the means to interchange the algorithms associated with their behaviours. State on the other hand helps objects to control their own behaviors. If you are not familiar with the behaviors and strategies, I strongly suggest to go and check out the previous article as I will be picking up those droids and make them utterly clever during the next articles. But first we need to take a closer look to how I design less clever entities, like weapons. Let’s design an old fashioned rifle and learn from the process how to design the next gen weapons to fend off the invading droid army. Breaking it down, what can one do with a rifle? Pull the trigger of course and reload (insert, eject the ammo clip). Let’s examine the diagram and figure out what it is and what is that we want. The above diagram is called a State Diagram. Each of those circles is a State and each of those arrows is a State Transition. Each state is just a different configuration of the rifle. The rifle behaves in certain ways depending in which state it is in and some action is needed to take it to another state. So, to go to another state, you will need to do something like pull the trigger or insert clip. See the arrows on the diagram. Note: I used third person for 3 of the actions. It is because the user of the weapon will trigger these actions while fire ammo is more of an internal action. The whole thing described above is also called a Finite State Machine. It is nothing more than an object that holds a finite number of states that govern behaviour and the object can be in only one state at any given time. Knowing all this, what would be our first choice for the implementation? A class that has all the possible states and actions, right? It should also hold the current state. Simple. Great! We created the structure of the rifle. We also want to know when we are out of ammo, so we added the ammoCount variable. They are set to default values. The rifle holds no clip thus the ammo is 0 when it is created. Now let’s add the actions. But beware! Exposing all the actions to someone handling the weapon is dangerous. What will happen when someone tries to pull out the clip while firing? We need to take these into consideration when triggering the actions. Let’s put the rifle to the test. It is a very simple scripted scenario which performs some actions on the rifle. Some may be good some bad. 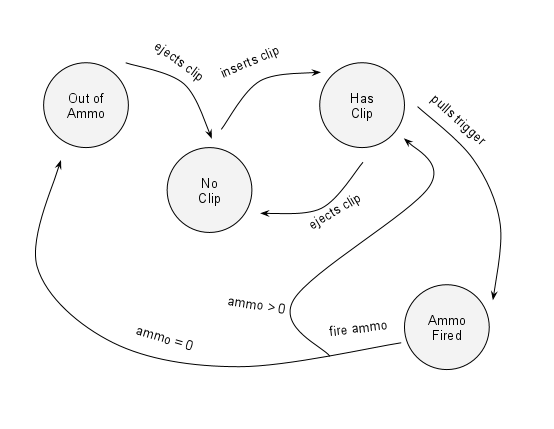 As when trying to force in a second clip or pulling the trigger when it’s out of ammo. Check out the result and examine it carefully. How cool is that? We are the Kalashnikovs of our age. > You have loaded a clip with 3 bullets. > Bullet on its way!
! * Click! Out of ammo.
! * You need to take out the empty clip first. > You have unloaded a clip.
! * Empty Click! – No clip! Note that I have omitted the toString() method for the Rifle. Well done! We have our first state machine. We can’t do much firing bullet by bullet. We need automatic fire! Oh, and we can’t just let people running around with rifles without the safety ON. Ah, that’s easy, right? We’ll have a few more states and a few more transitions. But wait, we will need to rework the Rifle class a bit. That is a LOT of work. It must be some other way. What if we give each state a behaviour and put it into its own class? This way each state will implement its own actions only. We will have the rifle class delegating the action to the state object that represents the current state. Let’s see how does it look? What you should notice is that the Has Clip is now Manual/Auto and has a switch transition. It basically has a sub-state now. Flipping the switch changes the behaviour. Both states will have the pull trigger action but each state will behave differently. This is easily achieved with interfaces, right? Let’s start coding then. First, let’s create the state interface. Remember, each state will implement its transition and will provide the dummy implementation for the rest. The interface will contain all the actions. The new Rifle class will have none of the implemented actions, but will have all the states and will delegate the actions to its current state. You see that the class has changed a bit. It has all the states and a current state. It has a constructor too. The constructor is needed to set up the rifle and pass itself as a reference to all of the states to give them access to the rifle’s properties. In our case just the ammo count and current state need to be accessed. Also the fireAmmo() is missing as it is a state internal action. Now let’s map the states to actual classes. These are the same as in the original rifle class. I will list one full class and for the rest only the methods that change the state. Examine the source code for the complete listings. Notice that the only way out of the OutOfAmmoState is by ejecting the clip. Every other attempt will do nothing. Also note the constructor. We are passing the reference to the rifle there. If you follow the diagram then you should be able to figure out the transitions. There is a trick there as the Manual and Auto modes are very similar and I just transition between them. 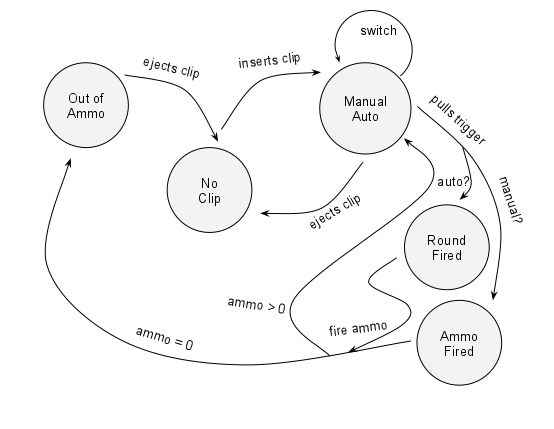 There is a drawback as after a reload, the manual state is the active one even if the auto was set before. But I’m sure you can figure out a quick fix. Great! Let’s throw together a test for the new shiny Rifle. Examine the output very carefully and go through the source code. You should try adding new features or think of other scenarios.
! * You can’t fire with an empty magazine.
! * The magazine is empty. > Switched to auto. Bring’em on!!! > BANG! >BANG! >BANG! >BANG! >BANG! >BANG! >BANG! > BANG! >BANG! >BANG! > Fired a round of 10 bullets. Yeah! >BANG! >BANG! >BANG! >BANG! >BANG! >BANG! >BANG! > BANG! >BANG! >BANG! > Switched to manual. Hope they are slow and few!
! * Clip is already present! > BANG! >BANG! >BANG! >BANG! >BANG! >BANG! >BANG! >BANG! > Fired a round of 8 bullets. Yeah! Voila! We have state machines and easily extensible game elements. I strongly encourage you to extend it and build your own, as it is a very important element of game design. You can apply this principle for the whole game and infrastructure. Think of the game as a whole and when you’re on the menu screen (that’s the Menu State), when you’re in the paused screen, that’s the Pause State, or the main screen that’s the Running State. You could create a framework and easily add different game states. I do hope this gave you a good introduction on how to implement state driven behaviours. Note that I used normal Java practices to write the code for clarity. Meaning that when writing a game, especially for Android, you might not need to overload your classes with getters and setters and you should adhere to the optimized ways. You could use public attributes and access them directly for example. But it was not the scope of this article. Also understanding this is crucial to make a step towards autonomous agents (automatons). Next time I will introduce event and/or message driven behaviours. We will return to our beloved droids to give them wits to outrun you. Download the source code and project here (TBD).